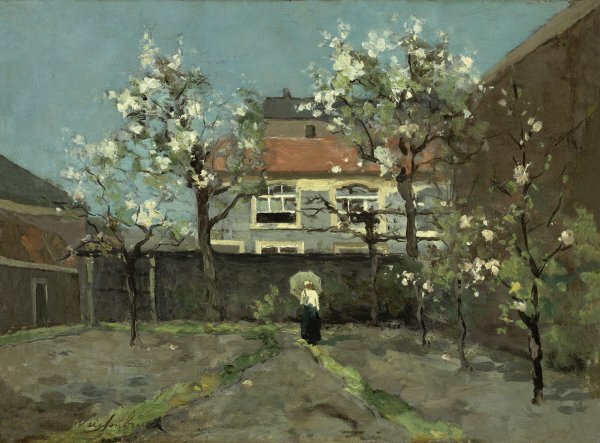 A splendid spring day with the trees in bloom, behind the wall of an urban garden... Is this not the motif that art experts tend to associate with the work of Jan Hendrik Weissenbruch? Of the works that have survived, the most typical depict atmospheric landscapes of the polders, with their heavy mass of clouds weighing down on the sparkling surface of the water, painted with considerable virtuosity in terms of brushwork, whether it be in watercolours or oils. Although Weissenbruch always placed the emphasis on the landscape-as he himself used to say, in that closed accent typical of the Hague: "[...] Nature... nature is my master" -he also used the picturesque surroundings of his house-workshop at Kazernestraat 112 in the Hague as a source of inspiration. As the artist himself used to say, he liked to take long walks around the Hague and the city's surrounding areas: "When I saw some beautiful corner, a lovely beach, some beautiful canals or a suggestive sky, or when I sat on a dune in order to look at the sea, I became absorbed by the beauty of nature. Sometimes nature made an impression on me, and with this emotion I was able to draw and paint what I was seeing or had seen. I was able to depict it with a few brushstrokes." Among the various urban views of the Hague, a small panel entitled The Fish Market in The Hague (Municipal Museum of the Hague) is well known, along with another entitled View of Kazernestraat, the street in which the house Weissenbruch was born in -and spent his whole life in- was located. The back garden which served as the theme for this painting, was probably located between the Kazernestraat and the residential villas of Lange Voorhout. The artist painted the garden more than once. In the collection preserved at the Boijmans-Van Beuningen Museum in Rotterdam, we find a vertical version of the left-hand corner of the garden during the first few months of the year. The version preserved at the Stedelijk Museum in Amsterdam, and a watercolour owned by a private collection, show this garden during a dark autumn day. Back Garden at the Kazernestraat, The Hague, cannot only be distinguished from the other versions due to the weather conditions and the time of year, but also due to the absence of white clothing. Following the example of his 17th century predecessor, Jacob van Ruisdael, Weissenbruch used white clothing as a source of light, in the same way as he used elements such as façades, windmills, sails or water lilies in other works due to their intense whiteness. In the picture we are dealing with here, the white flowers serve as a source of light, although the white blouse of the woman with the parasol stands out, above all, from the dark background. Weissenbruch's work is difficult to date, given that he tended to work on old projects. Only those paintings and watercolours produced by the artist in his early career are dated, along with those he produced in the years leading up to his death. It is possible that Back Garden at the Kazernestraat, The Hague dates from after 1870. The picture's intense movement indicates an early date; on other hand, the free brushstrokes and way in which he paints the grass suggests a somewhat later date. This may even be the picture that Weissenbruch sent to the Exhibition of Living Masters of the Hague in 1890 under the title Spring Day.